We are pleased to invite you all to visit the EMO Milano this year. 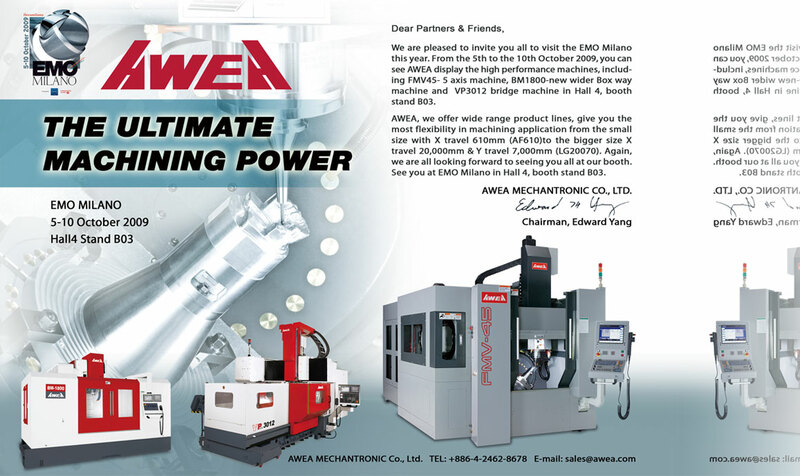 From the 5th to the 10th October 2009, you can see AWEA display the high performance machines, including FMV45-5 axis machine, BM 1800-new wider Box way machine and VP3012 bridge machine in Hall 4, booth stand B03. AWEA, we offer wide range product lines, give you the most flexibility in machining application from the small size with X travel 610mm ( AF610 ) to the bigger size X travel 20,000mm & Y travel 7,000mm ( LG20070 ). Again, we are all looking forward to seeing you all at our booth.see you at EMO Milano in Hall 4, booth stand B03.